Providing the support you need, when you need it the most. 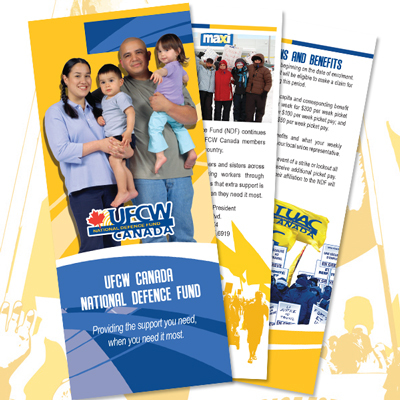 The UFCW Canada National Defence Fund (NDF) is your guarantee that, in the event of a strike or lockout, not only will your local union have the resources to fight even the biggest employer on your behalf, but you will receive extra strike benefits to reduce the impact of the strike on you and your family. The UFCW NDF was established in 1986 in anticipation of the possibility of major strikes in Canada's packinghouse industry that year. 1986 turned out to be a turning-point in the industry, with the six-and-a-half month strike by more than 1,000 members at Gainers Meats in Edmonton, and a shorter lockout of nearly 500 members at the Fletcher's Fine Foods packinghouse in nearby Red Deer. The fledgling NDF was able to help in the strike and the united front of the workers in 1986, and survived the extreme pressure on its resources in that first year. The NDF continues to support thousands of UFCW Canada members across the country. The NDF has been at the forefront of many of the biggest battles worker have seen with questionable employers in recent years. From the multi-province strike in 1997 against food-industry giant Maple Leaf, to Quebec struggles with retail stores of Super C, IGA and Maxi. The battles in the protein sector against Olymel in Quebec and XL Beef in Saskatchewan, and the Chateau Bathurst Hotel in New Brunswick. The goal and purpose of the fund is to provide members with further financial security during strikes and lockouts. The NDF provides three contribution rate levels. Contributions to the NDF are made on a monthly basis by the participating local unions on a per capita basis for each member in each affiliated unit for each week. The weekly per capita rate, as determined by a vote of the membership of each affiliated unit is $2.00 equivalent to $200 per week picket pay, $1.00 equivalent to $100 per week picket pay, or .50 cents equivalent to $50 per week picket pay.